Despite the fact that today there are a large number of alternative sources of heat, gas equipment is still in demand in this area. 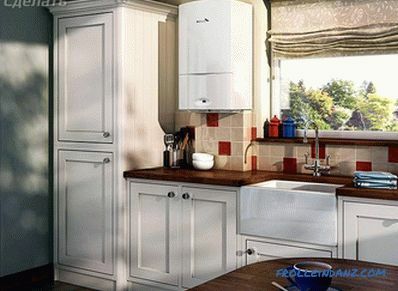 Gas boilers are able to supply the room with the necessary heat. At the same time, they can be installed both in the apartment and in a private house. In this article we will look at the requirements for this process, and also you will learn that installing a gas boiler with your own hands is possible. The room in which the boiler will be installed must meet certain requirements. Otherwise, it can lead to fatal consequences. Gas, as you know, is explosive, so jokes with it are bad. 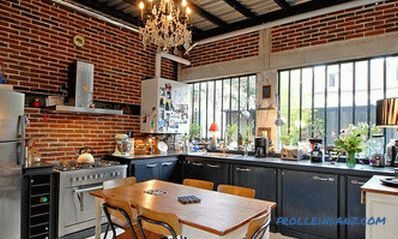 If the power of the boiler does not exceed 60 kW, then it can even be installed in the kitchen. However, there are also requirements that are important to consider. If the boiler has a capacity of up to 150 kW, it can be installed in any non-residential room at home, for example , bathroom, bathroom, kitchen. Boiler power from 150 kW and more is limited in the choice of location. 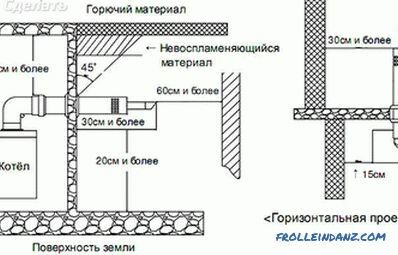 Allowed space for installation on the basement or ground floor. If the installation location is a kitchen, then for 1 kW of its capacity, 0.2 m 3 should fall. In the event of a gas leak, there must be an instrument in the room to shut off the gas supply. After installing the gas boiler, all major components should be provided with sufficient access for maintenance. As for the walls of the room, they must have a fire resistance level of up to 45 minutes. 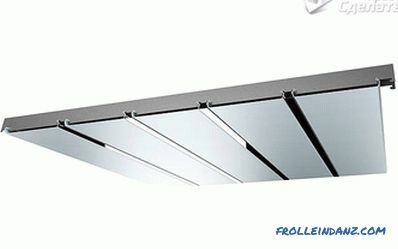 There are also requirements for the cross section of the grille for ventilation. Calculations on 1 kW of power of 8 cm 2 are taken. The diameter of the chimney must match the specified parameter in the boiler data sheet. The pipe should be 0.5 meters higher than the ridge. The chimney should be no more than 25. Up to 3 bends are permissible. There must be special holes to clean the chimney. The diameter of the chimney should be equal to or larger from the chimney opening. At a height of not less than 800 mm from the floor. There should be free space under the boiler. It is recommended to lay a metal sheet under the boiler on the floor. Before installing the boiler, you must have the necessary documentation that permits this. In particular, a gas supply project is being created for your apartment or house. These documents are developed by the gas supplying organization. In the course of receiving this documentation, you may be required to have a package of documents, which include the fact that you own this living space. The screed is poured onto the floor. 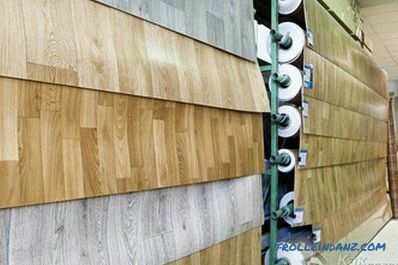 The floor should be treated with non-flammable material. Ensure that the surface is perfectly flat. It is also desirable to cover the walls with non-combustible material. Otherwise, the boiler cannot be moved close to the wall. It will be necessary to maintain a distance of up to 10 cm. Much easier to install when there is a project, which shows all the places for installation. On it, you mark the walls, and then make holes for fasteners. Also, the installed equipment at this stage is recommended to be connected to the pipeline going to radiators or with heated floors. If the boiler is already installed, it may be difficult to connect the equipment to the pipes. For this reason, it is better to do all this work before installing the boiler. 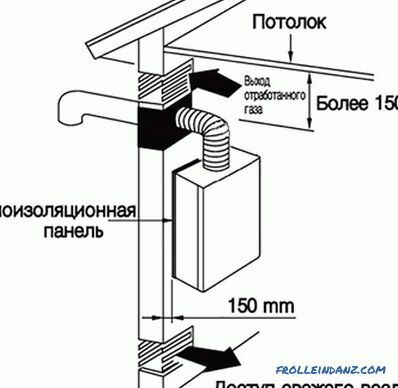 As for the installation of the floor boiler in the house, first of all it should be screwed on the sgony and adapters that are connected to the pipeline. Adapters can be of different diameter. 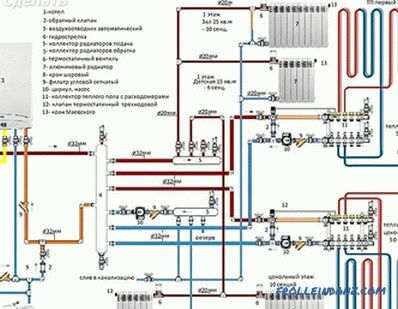 For example, if the system is with natural circulation, then thick pipes are supplied to the boiler. If the forced circulation, the pipe and, accordingly, adapters will be of small diameter. Having moved the boiler to a prepared place, it should be connected to the chimney. Next, connect the security group and connect to the rest of the strapping. If you once hung cabinets, shelves, and similar items, then installing the wall-mounted boiler will be easy for you. The wall must be flat and durable. In most cases, the boilers in the apartment are mounted on the mounting bar. It should be fixed to the wall at the desired height. Depending on the wall decoration, it may be necessary to fix non-combustible material, up to 3 mm thick. Also consider the fact that the boiler should be hung at a distance of at least 20 cm from other equipment. 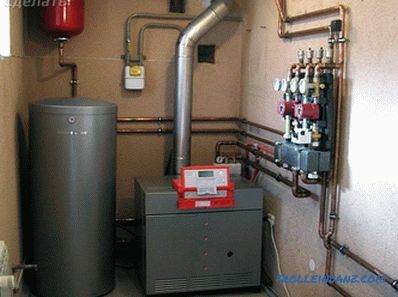 Modern wall-mounted boilers have a lower connection to the heating system and water supply. Therefore, after fixing the boiler to the wall, the boiler is being strapped. 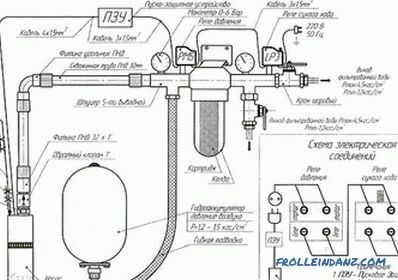 After installing the boiler, it is also necessary to connect the gas pipeline. This stage of work should be done carefully, because you should not “joke” with gas. 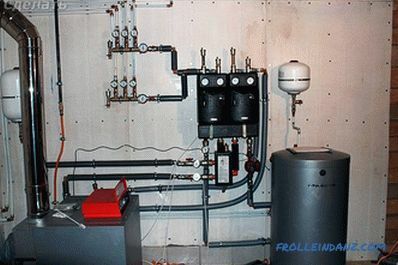 The connection includes the installation of a filter and valve, which, if necessary, can shut off the gas supply. Next, connect a special gas hose. But in any case, you can not install a rubber hose. After a while, it will crack. 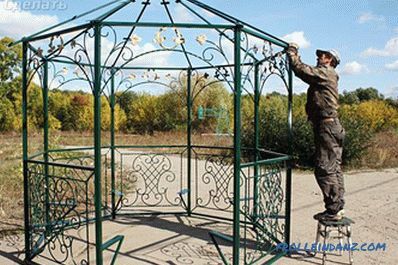 To seal the thread used paronitovye gaskets. After tightening the nut of the hose, be sure to check it for gas. 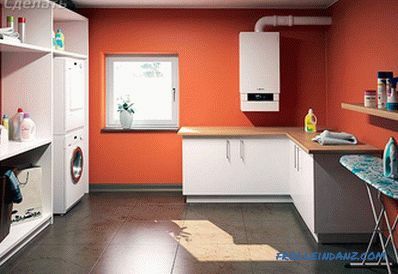 So, we have discussed with you the basic rules for installing a floor and wall-mounted gas boiler. You can share your experience on the work done in the comments to this article. You can also see installation diagrams in the appropriate section.